Have you seen the Paper Craft Planet community on Ning? where all of us crazy crafters can hang together. 9) BUT if they fit, you could make cupcakes in ice cream cones to put in them! 10) Check out these hand-dipped ice-cream cone cuppies! 14) Tanya's cupcake card template (with link to blog tutorial) Sweet! 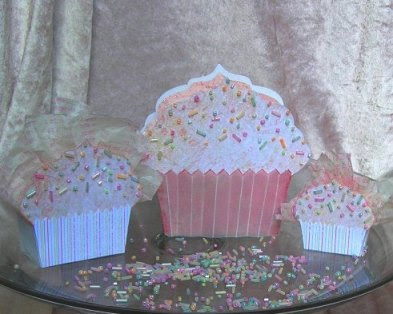 33) & Debbie's single cupcake box too! 3) Better Homes & Gardens cake slice: Sign up for free membership or find the PDF by scrolling down here. (a template, of course, with a nesties window) :O) I tell ya, I need 8 arms! I wouldn't care how scary I looked if I could make 4 projects at once. heeheehee. I never knew there were so many cupcake stuff online! That's why we have you to find all the fun projects for us! LOL! Whenever i come over I just look at everything and I wish I could make them all! Your cupcakes definitely look yummy. So yummy, they're almost look good enough to eat. Love how you made differents sizes and love the sprinkles. Very detailed! Mel I love cupcakes, I love you and I love all these links. Your ROCK!!!! TFS. Thanks for these links! You rock as usual! Thanks for taking the time and sharing all these links. I may have to make some!!! Here is another one of those cute little purses! LOVE them- so cute and so easy! Well, this is right up my alley! Thanks for posting all of these links. How do you do it? How do you find the time to find all these links? Those cuppy cakes look yummy enough to eat! Mel! Thank you for the great links! Thank you for doing it for us! Wealth of information. Can I come spend a week with you. I want to know how you organize everything. I get so flustered with the few links I have. Super duper cup cakes by the way. Now I want some real ones to eat. How darn cute and 'sweet' too! Very creative and pretty! Adorable cupcakes, the beads are the perfect touch!! Thanks for all the links!! How long did that take you? I'm so slow on the computer, that post would probably take me WELL over an hour!! wow, that's alot of links! who knew there was so much out there about cupcakes! Thanks for linking! OMG - what a wonderful collection of links. Thanks so much! I am OBSESSED with cupcakes, thank you so much for sharing this list. Super cute! I can't wait to make them for my Cupcakes first birthday. Is there a particular type or weight paper you'd recommend using? Thanks for all these awesome cupcake helps! I'm planning a cupcake decorating party for my 10 year old. Now I have tons of ideas!